Nothing about the road to Shenmue 3 has been easy. Fans in the online community who've followed the twists and turns of the "impossible" sequel for over a decade and a half, told countless times with a chuckle or a sneer that it would never happen, know this better than anyone. But even with development now in full swing and aiming for release in the second half of this year, the weight of expectation on director Yu Suzuki's shoulders must place him in as challenging a position as he's ever been. Fans are clamoring for a more in-depth look at the game, showcasing gameplay, voice acting, and final character models. A portion of Kickstarter backers wave their receipts in the air and demand a seat at every progress meeting. Organizers of gaming events hope to play host to the next big reveal, and with every promotional opportunity deemed to be missed or underutilized, the media sharpens its knives. But this is no ordinary project, and ordinary rules have never applied. Shenmue 3 is neither a triple-A behemoth commissioned by Sega, nor a fully independent title free of all corporate obligations. Critics may be demanding a polished trailer representative of the final product, but its global publisher, Deep Silver - whose investment last summer enabled an extension in the game's development - has its own marketing strategy. The end goal is to turn enough profit from a wide audience to earn the series a future, not just to relieve the impatience of vocal fans with a short term fix. And so the company with experience in selling games from the Yakuza, Persona, and Life is Strange franchises must coordinate the release of Shenmue 3's juiciest, most anticipated preview material in a manner that will make the most impact at the most critical moment. That moment was not two weeks ago at MAGIC Monaco, whose provisional content was intended as a bonus for those in attendance. 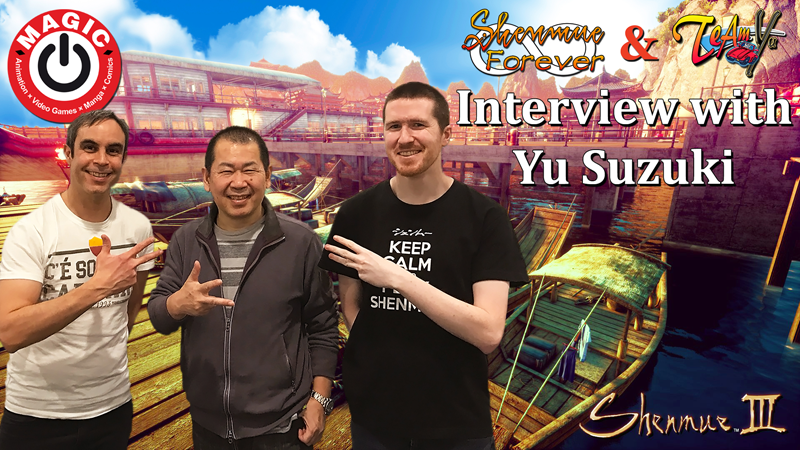 But it was the scene for numerous fan community outlets to obtain information directly from Yu Suzuki to share with the world, including this exclusive interview conducted by Cosman of Shenmue Forever and James of Team Yu. We began by asking Suzuki-san to compare his life today with five years ago, and he wasted no time in describing his work on Shenmue as the biggest change. "I wasn't working on it five years ago, so the time I have spent thinking about Shenmue and working with Shenmue has increased hugely. So there has been a big change for my family, my friends, of course for my staff, and for my own life." Previous statements have indicated that Yu and his team are inclined to work six days a week and are no strangers to sleeping at the office, with his loved ones seeing him less often than they had become accustomed. It seems fair to say that Suzuki, given the chance to realize a dream, is almost consumed with delivering the best possible product within the projected time frame. So what's the current stage of development? We asked about the main tasks laying ahead in creating Shenmue 3. "I can't really tell you in detail, but right now, I'm thinking about how best to tune the battles," he said, "By tune, I mean how to give them flavor; what kind of battles to make. The foundation for battles is complete but I'm thinking about how to serve them up. I think that's the biggest area." Recent comments in other interviews, including one conducted by Shenmue 500K the same day, corroborate Suzuki's meaning that the combat system itself is essentially in place, and that what's left to be determined are the scenes themselves, and their structure, in which it will be put to use. The original games had a variety of settings for fisticuffs: formal one-on-one contests, group ambushes, sparring with martial arts masters... No doubt we can expect the sequel to present a range of applications for those Hazuki Style moves. Diversity in the gameplay, story, and world of Shenmue is, after all, a calling card of the series. When we enquired as to the kind of enhancements made possible by the deal with Deep Silver, Suzuki-san explained that "the biggest area of enhancement has been the open world aspect, which has undergone a boost. For example, the play fields have become more open, the number of characters has increased, and the scenarios have gained more depth. So, like I mentioned just now, it's mainly the open world aspect. I think bigger is better for an open world, and that base has grown larger." Part of that open world experience of course is the wealth of minigames and side activities, such as the Lucky Hit stands and capsule toy trading in previous chapters. We asked what kind of optional pursuits would be available in Shenmue 3, and how they'd be more connected to other elements of the game as alluded to at Gamescom last year. "You'll earn money at part-time jobs," Suzuki-san explained, "And there will be amusement spots where you can increase your money - of course, you may also end up losing money. So in this way your money can increase and decrease like at a casino, although casino's the wrong word to use." A word that easily came to mind however, as being in Monte Carlo, we were naturally sitting next door to a casino at the time. "Then with your increased money you can buy and sell items," he went on, "As well as that, there's also collecting; the player can get some items in the play field, and buy and sell them. They can be converted to money and used to buy skill books. If the player obtains a skill book, they become able to use that skill, and so the player will get stronger and do better in battles. This is how I'd like to shape it. These will all connect together in a balanced manner. That's what I would like to realize this time." As those in the organized fan community will know, recently the English voice cast of the original games reunited to raise money for charity. Knowing that it might be tough to answer at this stage, we still wanted to ask the question of whether they'd also be reunited in Shenmue 3, besides the already announced return of Corey Marshall as Ryo. "That is still to be confirmed," Suzuki replied of the other cast members, "I'm not able to give you an official answer about it yet, sorry." The City of Yokosuka recently published an official Shenmue-themed guide map for tourists who want to follow in Ryo's footsteps around his hometown. Did Suzuki-san envisage the large number of fans making that journey? He knew exactly what we were referring to: "I didn't in the least expect it! I've seen the pamphlet, and it's so neat that people can now go on a 'pilgrimage' and visit the same places as in the game." With that in mind, could Shenmue 3 attract more tourism in parts of China? "Shenmue 3 takes place in Guilin, China. They say it's the place with the most beautiful rivers and scenery in China. So everyone who plays Shenmue 3 will want to visit Guilin! I'd really like them to go to China." In closing we approached a subject that has, in the days since MAGIC Monaco, been pounced upon by purveyors (and consumers) of clickbait journalism within the gaming media. 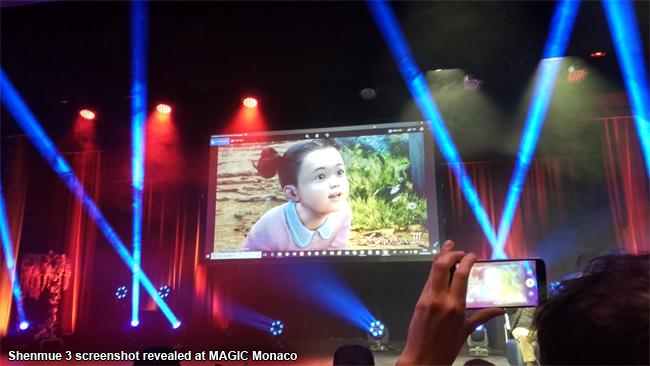 In another interview conducted at the event, French website Gamers Flag asked Suzuki whether Shenmue 3's story would be left open for another sequel, to which he replied that it would, due to there being too much of the pre-written plot to squeeze into a third and final game in a way that would be satisfactory to fans. Seizing upon this supposed revelation, which had in fact been acknowledged by Suzuki-san both before and during Shenmue 3's Kickstarter campaign, multiple news outlets began running headlines about him "already planning Shenmue 4," as if getting ahead of himself and looking recklessly beyond the game currently in development. The kind of headline that, to our knowledge at least, never gets written about other franchises with sequel-spanning storylines. But what we wanted to learn with our own final question to the director of Shenmue 3 was whether he intends the work being done on this game to provide the technical foundations on which Shenmue 4 could, if the opportunity should arise, be built. "I think we'll be able to make use of many parts of the system," he said, "Such as the graphic resources and the technical base. Since it's something we've built up, we'll be able to expand and improve it to turn it into something even better. And even better is that we've got a good team in the current Shenmue 3 team, so if we work together again we'll be able to make something really great." What we take from this is that any budget secured for another game in the series will be able to go further than Shenmue 3's funding, which has had to cover both a learning curve in modern practices and the creation of assets and systems that need not be duplicated when developing future content. Much like the first two games on Dreamcast, investments made into Shenmue 3 are expected to pay dividends over the long term, provided Suzuki and his team get the chance this time to reap what has been sewn. 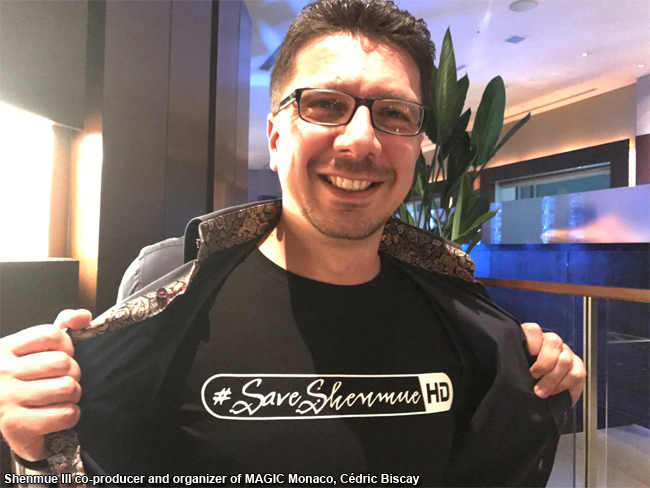 To help secure the possibility of a Shenmue 4, the #SaveShenmueHD campaign runs a monthly Tweetathon asking Sega to release new versions of Shenmue 1 and 2 this year. With more players able to experience the saga from the beginning, sales of Shenmue 3 are more likely to attract a deal for that necessary fourth game, allowing us all to keep calm and play Shenmue. Like fans around the world tweeting every 3rd of the month, those descending upon MAGIC Monaco showed their support for this aim by proudly displaying the hashtag in person. With the help of such a passionate following across continents, fulfilling his repeated requests to implore Sega for these remasters, Yu Suzuki can hope for Shenmue's audience to grow so that Shenmue 4 becomes financially viable. Both he and the fans must do all we can to secure that next sequel, as it's been known for years that a rushed ending in Shenmue 3 would be no ending at all. Just like the release of marketing material, he's as keen to conclude the story as we are, but he wants to do it right. Our thanks to Sílvia, George, Heather, Firat, and Alfonso for their help compiling this video, and to all those taking part in it. We'd also like to thank Shenmue Master, Shibuya Productions, Deep Silver, and of course Yu Suzuki and Ys Net for facilitating this February 2018 interview, and Shenmue 500K and SEGASaturno for their support. Please be sure to check out the interviews conducted by those fan community outlets when published! Last but not least, we owe the accuracy of the English translation of Yu Suzuki's words to the ever reliable talents of Switch at PhantomRiverStone.com.